Cost: Set lunches & dinners including dim sum are £45 to £60 per person, with a Taste of Yauatcha Set at £29 available from Monday to Thursday from 2-6pm. The à la carte menu has dim sum from around £4 to £11 per portion, steamed dover sole or halibut around the £30 mark, and beef, pork, duck and chicken dishes from around £12 to £20. Desserts are £8.50. About: Yauatcha is the only 1 Michelin starred dim sum restaurant in the UK, opened in 2004 by serial restaurateur Alan Yau. Best known for founding Wagamama, Yau was also the man behind Hakkasan, Busaba Eathai and Cha Cha Moon. Alan Yau has since then sold off his stake in the group. Yauatcha specialises in dim sum and other small eats, and also features an excellent range of Chinese and Indian teas and French patisserie. Being tucked away between Oxford Street and Soho, this makes it a great place for afternoon tea after hitting the high street. I've been to Yauatcha numerous times over the years, but took this opportunity to sample its menu and write it up. The restaurant is open seven days a week from noon until 11.30pm, (10.30pm on Sundays). Set on the ground floor and basement, the seating and decor is swish and contemporary, with few allusions to its Asian origins. The atmosphere is vibrant with a constant stream of diners coming and going making it also a perfect place for people watching. What we Ate: I wanted to sample a broad range of options, and so we chose from the à la carte menu. We kicked off with roast duck pumpkin puff with pine nut (£5.80). This is a lovely signature dish from the sister restaurant Hakkasan, and one I always order. Yauatcha’s version was just as good - crispy on the outside with a lightly sweet pastry and meat filling. The Chinese chive and prawn dumplings (£5.70) came in a beautiful jade-green and very delicate rice pastry case, and were fresh and delectable. The cheung-fun of striploin beef and enoki mushrooms (£9.80) was intriguing - the enoki mushrooms were wrapped in very finely sliced beef, fried and then encased in cheung-fun rice pastry – very creative and with varying textures. The chicken Shanghai dumplings (£4.90) were good, although I thought the rice pastry could have been a tad thinner. Spicy soft shell crab (£13.50) was served on flaked almonds, dried shrimp and kaffir lime leaves, as well as being a visually stunning dish, the batter was light and crispy, and the crab well flavoured. The sticky rice steamed in lotus leaf is another favourite - stuffed with chicken and dried shrimp (£ 5.20), Yauatcha’s version did not disappoint. The main course was a steamed Dover sole with black bean sauce (£28.80). Served skinned and filleted in slices, this was expertly cooked and deboned, and served with shiitake mushrooms, red chilli and chives. The black bean and chilli sauce imparted a rich and intense flavour to the dish. To contrast the delicate sole dish, we opted for a feisty stir-fried, double cooked pork belly in chilli sauce (£11.60) which was meltingly tender. For our accompanying noodle, we opted for a beef Ho Fun (£11.20) - stir-fried at high temperature to impart a delectable smoky quality to the beef, noodles and dish as a whole. For vegetable we had a combination of spicy aubergine, sato beans, okra and French beans with peanut (£12.20). This was really good, with tender aubergine and with the sato beans adding a rich texture and complex nutty, slightly sulphurous flavours. For dessert, we had the St Honoré (£8.50). I thought this was utterly exquisite - perfect pastry filled with ice cream infused with rhubarb, ginger and vanilla, then delicately latticed with white chocolate. We also had the Guava Dome. With guava, passion fruit, tropical salsa and a Sable Breton (£8.50), this was also very good but could not rival the magnificent St Honoré. What we Drank: The drinks menu is extensive, well thought-out and surprisingly good value. Alcoholic cocktails cost £10, and house wines are available by the glass at £6.40 (white Malvasia) or £7.10 (red Portuguese Alentejo). By the bottle, whites start at £26, reds at £29, and there is a good selection under £35. There is an excellent range of Champagnes at prices extending right up to the Dom Pérignon Rosé 2000 at £464. The restaurant offers two wine flights, available to accompany lunch or dinner. The Fine Wine flight includes three 125 ml glasses for £35 - a Taittinger Champagne, Chablis 'La Jouchéré', Domain Laroche 2012, and Pinot Noir, Astrolabe 2011, Marlborough, New Zealand. There is also a £20 wine flight, which includes 100ml each of a Spanish Malvasia, a Greek rosé from the Peloponnese, a Mencía Roble from Spain, and a 50ml glass of LBV Quinta de la Rosa to match dessert. 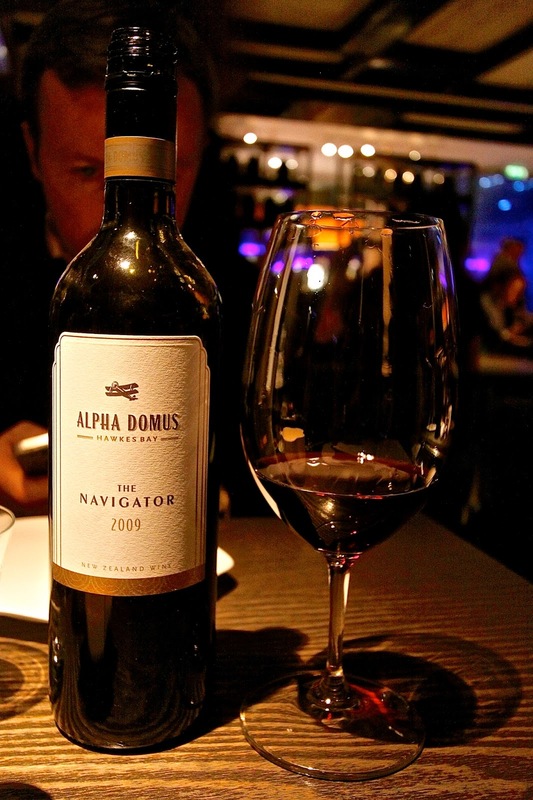 We were tempted by one of the wine flights, but after discussion with the knowledgeable sommelier Stefano, we opted for a bottle of The Navigator 2009, Alpha Domus, Hawkes Bay, New Zealand (£40). A Bordeaux blend of cabernet sauvignon and merlot, this had good blackberry fruit with balancing tannins, and a long spicy finish enhanced by the Riedel glasses used at Yauatcha. It was an excellent partner to the gutsy meat dishes. Likes: Stylish venue, central location between Soho and Oxford Circus, open all day for dim sum, patisserie and teas, extensive cocktail, wine and Champagne list. The dim sum are consistently good, and unusually for a Chinese restaurant, the fine French desserts like the St Honoré (given an Asian twist) are outstanding. Dislikes: The restaurant is perennially popular, and gets packed to the gills which does not make for the most relaxing of places. Verdict: After more than a decade in business, and having received a Michelin star from the start, Yauatcha remains in my opinion one of the best dim sum destinations in London. With also some excellent main courses, exquisite desserts and a very good wine list, it delivers a great restaurant experience. Highly recommended.